Carol's Theatre Reviews ~ It's Fun To Go Out: Note To Self: Put Ken Ludwig’s Summer Romp, “Robin Hood!” On To Do List. Note To Self: Put Ken Ludwig’s Summer Romp, “Robin Hood!” On To Do List. Ken “Lend Me A Tenor” Ludwig is at it again. His brand new ‘summer romp’ “Robin Hood!” is making its world premiere at the Old Globe Theatre in the Sheryl and Harvey White Theatre through Sept 3rd. A few years ago he brought us “Baskerville: A Sherlock Holmes Mystery". It too played out on the Sheryl and Harvey White stage. 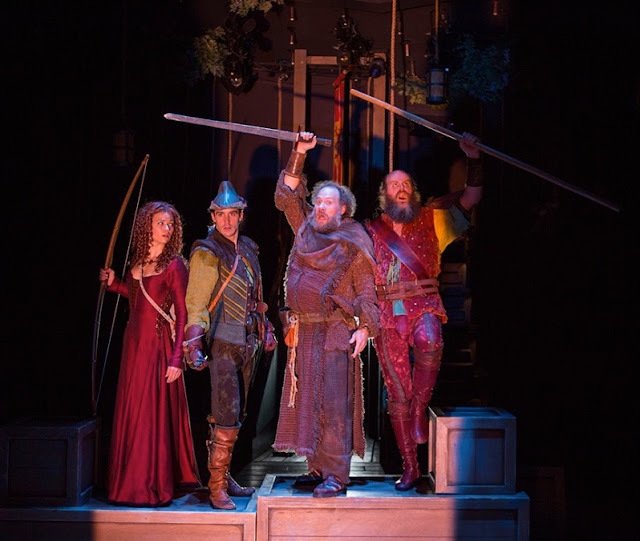 Based on the “robbing from the rich giving to the poor” English legend folklore hero, Robin Hood and his band of merry men (and a couple of gals) traveled centuries from the forests of Sherwood, Nottingham, England 1194, to the stages of San Diego courtesy of Ludwig. We’re seeing it first time out of the chute. Ludwig doesn’t reinvent Robin Hood. He doesn’t have to. 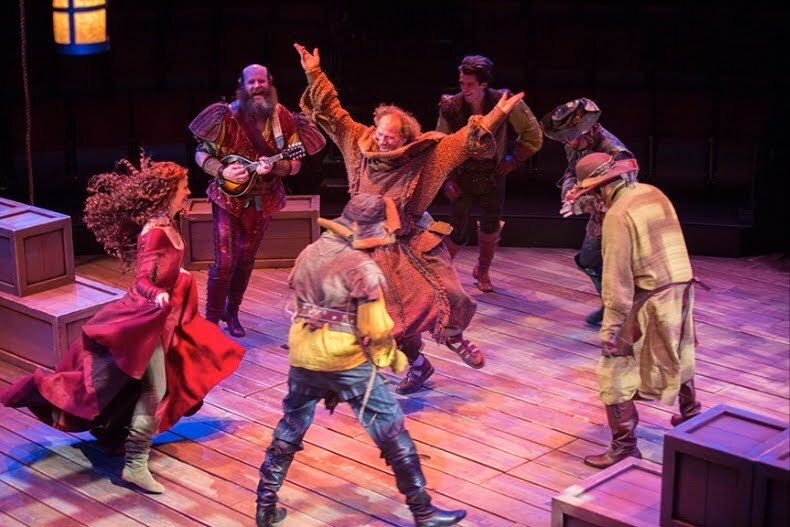 Instead he capitalizes on the do- good character by throwing in some choice dialogue (“I suppose you believe in the Easter Bunny?”) here and there, a bit of audience participation, (“Do you mind if we shoot an apple off your head”), many laughs, a few gags, a number of sword fights, and an original ballad by Fitz Patton. (I felt like I was at a Peter, Paul and Mary songfest). There is dancing, plays on words, some partying, romance and a bow and arrow shoot off and all done by eight actors (some taking on multiple roles). Keep your eyes peeled on those arrows. They come from nowhere and always manage to hit their mark. THWAP! He throws in some Shakespeare (Shakespeare?) and there is some clever stagecraft by scenic designer Tim Mackabee using big wooden blocks to mime climbing a prison wall that is brilliant. Credit to the someone that came up with ‘sound is faster than the eye’ magic when the arrows fly. It took me about half way through the first act to figure out the bow trick as well. Let me know. Tight direction by Jessica Stone is a plus. Awesomely designed period costumes by Greg Barnes (“Drowsy Chaperone” 2006 Tony award) give the entire production an authentic and timely look. Jacob Grigolia-Rosenbaum’s fight training helps a whole lot in the swashbuckling arena. 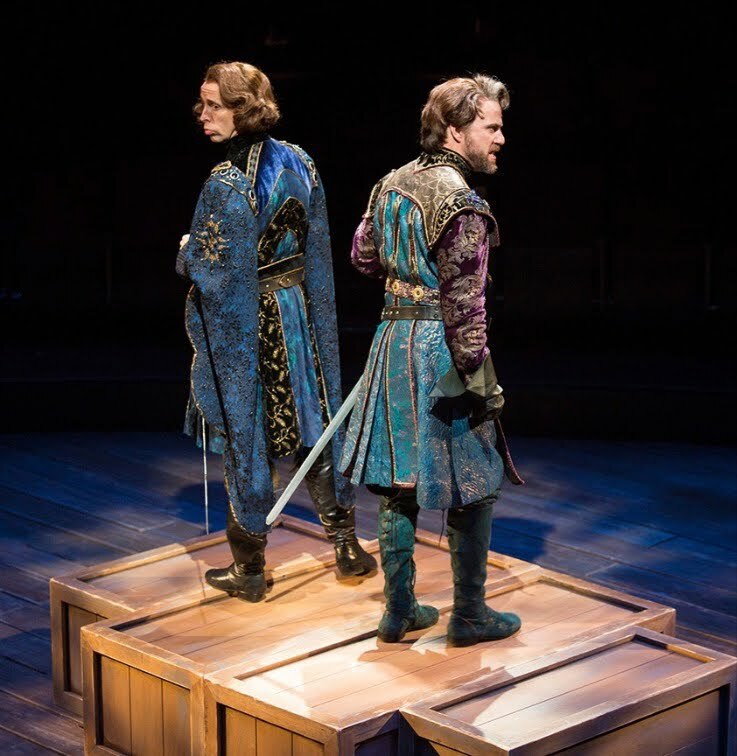 Seeing it on stage makes this up close and personal Robin Hood more fun to watch than the movie version of itself with Errol Flynn. The two –hour- comedy flew by like the characters dropping in from the rafters. It’s fun, bursting with merriment and music and fine- tuned with a great supporting cast of characters. Needless to say, his larger than life presence is not to be ignored. He’s everywhere, as he should be. The story starts the at the soon to be hanging of the now captured Robin Hood (Daniel Reece) and then takes a leap back in time to his birth and his growing up years to his coming of age, to his callous ways of one born to wealth, to early romances to his coming to Jesus moment of taking from the rich and giving to the poor. 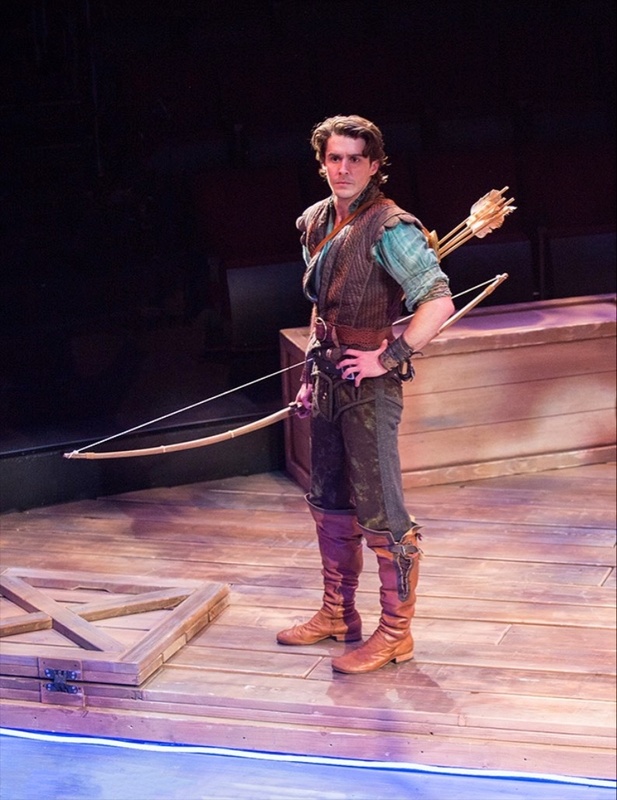 Reece, a newcomer to our stages has just the right balance of comic timing, nimble swordsmanship, reluctant lover to making us want to cheer him on all occasions even when he’s somewhat of a dweeb to Maid Marian (a beautifully talented Meredith Garretson) whose head over heels for him…but. The Heckle and Jeckle couple, The Sheriff of Nottingham and Sir Guy of Gisbourne (Kevin Cahoon and Manoel Felciano) provide cunning and humor. They are the bad guys; one’s a buffoon the other to be taken more seriously. Both succeed in making us want to cheer for their failings. Well? Sir Guy’s and his sidekick’s obsession is to find and hang Robin Hood for ‘breaking the law’ (“Hang this man immediately”). The band -of -outlaws has their job to do as well. They hide out in the forests (again an awesome looking set and fine filtered lighting by Jason Lyons) and continue looting from the haves, giving to the have nots' and work at chipping away with human suffering and death. It’s all so now in the scheme of things. Paul Whitty, another newcomer, is John Little aka ‘Little John’. His name is as off center as is his character, and I say that in satirical way. Whitty stands about six feet plus and is a gentle giant of a man who comes into the Robin’s nest after his wife (not seen) died of malnutrition because of the wholesale looting by the landlords. He’s a perfect fit with an even disposition calming those over the top personalities, and… he plays the mandolin. He also duels with long poles rather than swords keeping up with the macho combat so noted for in that time frame. Topping it off, he’s a splendid actor and a keeper. 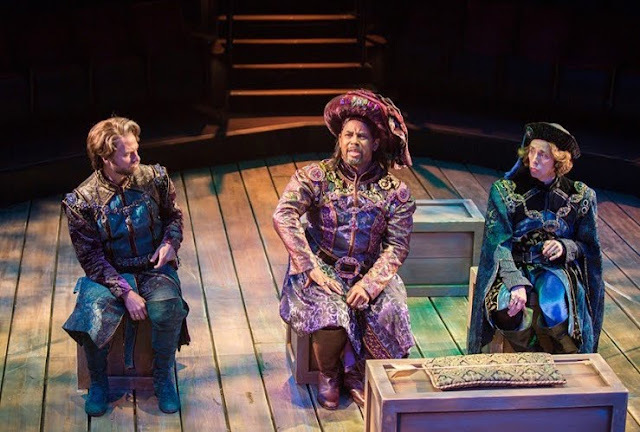 Michael Boatman is Much the Miller and Prince John, the Shakespeare quoting member of the opposition: “All the world’s a stage and you men and women full of layers. My God that was almost perfect. I should be a poet.” He’s another scoundrel, but we expected that. He too is a perfect fit. Suzelle Palacios is Doerwynn, a character Ludwig threw in for balance, a new perspective and love interest. No spoilers. She is a second year MFA student and it appears she’s going places. Yes, we have romance, dueling swords, and miserable -money- grubbing kings, and lords at their disposal, beautiful women and do -gooder’s. “It’s Robin Hood” for heavens sake!